March 1-3, 2011 at IEC Crocus Expo there being held 3rd edition of Polyurethanex - 2011 exhibition - a leading international specialized event in polyurethane industry in Russia, where full range of manufactures of raw materials, equipment and finished products of polyurethanes is widely introduced. In comparison with the last year display area increased by more than 80 percents. Among the exhibitors were the following companies: Chemtura, Huntsman, R.M.P.A. Srl, Biesterfeld Spezialchemie Rus LLC, Defom LLC, Kronos SPb paint and coatings plant, FKP Permsky Gun-Powder plant, Momentive Performance Materials Rus LLC, BorsodChem Zrt., Polyols Plant LLC, Companies group PROMUS LLC, Polyru LLC, H&S Anlagentechnik GmbH and others. March 1, 2011 within the business program of the exhibition there being held the Current State and Prospects of Development of Production and Use of Polyurethane Materials in Russia, 3rd International Practical-Research Seminar which consisted of the specialists' presentations of Momentive Performance Materials Rus LLC with "Niax-Urethane Additives of Momentive. Momentive suggestions in terms of future ban for usage of HCFC-141 b as a blowing agent in the rigid foam formulations" report and Soyussnab (group of companies) with "Denatol Ozone Friendly Components Systems for Rigid Foams Manufacturing". First time in Russia, Primeaux Associates LLC (USA) - a world leader in polyurea equipment manufacturer - took part in the seminar. President of the company - Mr. Dudley Primeaux - narrated about "New Opportunities with Polyurea Spray Technology". At the same time with Polyurethanex, the International Specialized Exhibition Composite-Expo ran for the forth time and allowed a wide range of specialists to get acquainted with innovation technologies of manufacturing and samples of finished products of composite materials for different branches of industry and the 3rd International Specialized Exhibition "Innovation Materials and Technologies" including the following sections: Magnets, High-Pure Materials, Technical Ceramics, Functional nanomaterials, Rare Earth Metals. Having a few exhibitors for now, the exhibition, in exhibitors' opinion, has great prospects of developments. According to the exponents' appraisal, the effectiveness of the exhibitions surpassed all expectations. On the space of 2000 sq. m there situated 77 exhibitors, including 27 foreign companies from the USA, Germany, France, United Kingdom, Belgium, Italy, Turkey, Hungary, Luxemburg, Macedonia, China, Ukraine, Byelorussia. Over 3500 specialists in different fields of industry visited the exhibitions. It is evidence of the growing demands of the Russian market to use modern innovation materials and technologies in different industries. 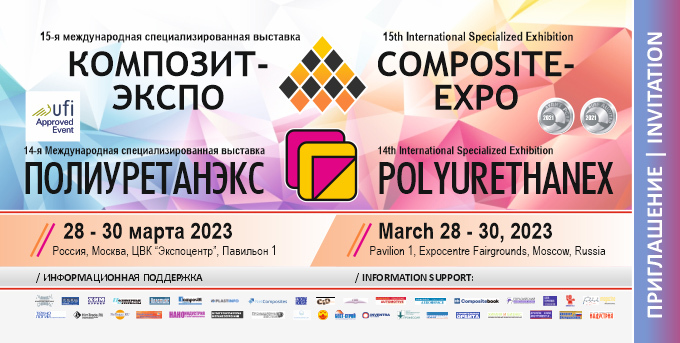 The majority of the exponents showed the intention to take part in the 4th International Specialized Exhibition "Polyurethanex - 2012" next year. It's planned to be held in February 28 - March 1, 2012 in Crocus-Expo, Moscow. 3rd International Practical-Research Seminar "Modern State and Prospects of Development of Polyurethane Materials Production and Use in Russia"
Larisa L. Luchkina, Advanced Manufacturing Engineer, Doctor of Chemistry, SoyuzSnab Group of Companies, Krasnogorsk, Moscow Region, Russia. Chemtura LLC on behalf of Chemtura Corporation, USA took part in "Polyurethanex" for the second time. It gave us an opportunity to organize few important meetings and meet some new potential clients. We express our gratitude to organizers for their help in exhibition organization and settling organizational issues. Dr. Irina Voronina, Sales & Marketing Manager in Polyurethanes, Biesterfeld Spezialchemie Rus, LLC. Russian representative office of Biesterfeld Spezialchemie GmbH being and official distributor of Air Products & Chemicals producing a wide range of additives for polyurethane manufacturing, would like to send you our respect and thank you for good organization of Polyurethanex-2011. Crocus Expo being a good exhibition platform, provided a good footfall of specialists of the industry. We'd gladly consider a possibility of being an exhibitor of next Polyurethanex - 2012. Nurmukhametova Tatyana, Quality Deputy Director of Unikom-Servis, NPP, LLC. There was a good move to hold two exhibitions dedicated to composite and polyurethane materials at the same time and the same place. This gave a birth to new interesting and perspective directions and developments. There were many contacts with not only suppliers, but with clients and manufacturers of the same range of products. High level of activity of the different parties indicates a great interest among many people. Many thanks to organizers for prompt replies and reactions to our bids and wishes. Our company was participating in "Polyuretanex" exhibition for the first time and we are satisfied with taken decision. We would like to point out a professional level of the exhibition organization as well as very good attendance and appropriate visitors structure. Among our visitors we could mention directors, head of departments and specialists. During exhibition we had a lot of interesting meetings with our existing and potential customers. We have also established several new promising contacts. In general we are very much satisfied with the exhibition and are planning to participate next year as well.